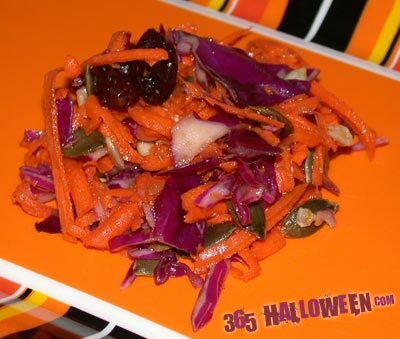 Beautiful Halloween shades of purple, orange, and green await you in this simple slaw! It contains only fresh, raw ingredients, and is packed with complimentary flavors and textures. It is suitable for a side dish or even a healthy Halloween treat. This is also a great way to get kids who "don’t like vegetables" to load up their plates with carrots and cabbage! Dissolve the maple syrup in the lemon juice. Add remaining ingredients. Pour over salad and toss. Allow to marinate at least 15 minutes. To serve, leave in large bowl for individual serving or pile tall mounds (as seen in pictures) on separate plates. *Adjust ginger to your tastes. I usually use 1 Tbsp. powdered ginger which is too much for many people, but suits me fine. Stick to fresh ginger for a more subdued taste. 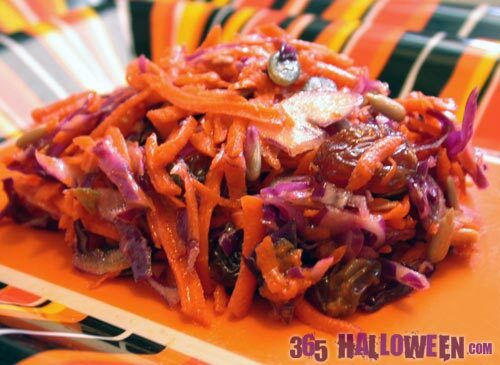 create your own Simple Spooky Slaw Recipe. 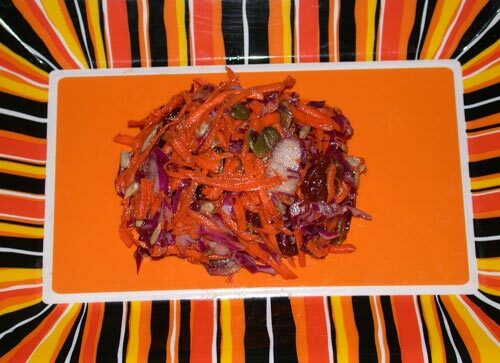 Subscribe to comments with RSS or TrackBack to 'Simple Spooky Slaw Recipe'.